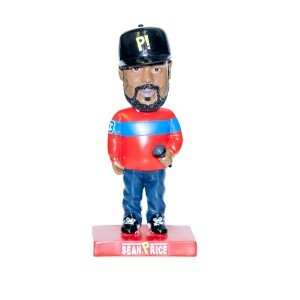 Honor the legacy of Sean Price with this exclusive Limited-Edition 7.5 inch bobblehead. Â Each bobblehead was custom made out of hard poly-resin & hand painted. The full-color box measures 9.5 inches and the art showcases Seanâ€™s local Brownsville, Brooklyn neighborhood with the common places he visited. Â With only a limited quantity of 500 units available, be sure to get your one-of-a-kind Sean Price bobblehead today before they sell out! Â Proceeds from the sales will benefit Sean Priceâ€™s family.